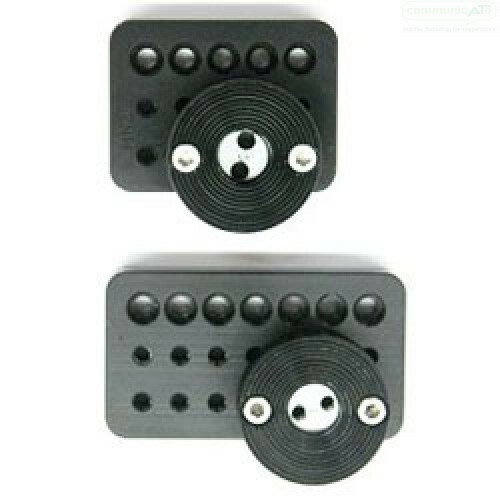 The Multi-Hole Inner Piece Adapter is used commonly with Pride Mobility Quantum Wheelchairs, Invacare TDX or other power-base wheelchairs where a seat-base dovetail track is present. Comes with extra bolts as well as an appropriate Tnut system. The Multi-Hole Inner Piece Adapter is used in place of a round Frame Clamp Inner Piece when no tube is available to clamp around, when a square frame tube has existing bolt holes for attachment. Most commonly, it is best used when the seat base has a dovetail track where a Tnut is slid into the track and the Adapter bolted to the Tnut. This forms quite a strong attachment poiny. Hole Adapter (MH2) has five countersunk bolt holes spaced at 1/2" increments and the medium Multi-Hole Adapter (MH3) has seven. They both have two rows of seven threaded holes spaced at 1/2" increments. The Inner Piece Adapter is attached with bolts into the threaded holes of the adapter after the component has been installed onto the wheelchair. Outer Pieces are then attached to this complete Inner Piece. Other bolts, washers and nylock nuts are supplied with these parts in case existing wheelchair frame holes can be utilised. The MH2 or small variant is useful if space is tight on the seat-base track e.g. where armrests and lap-belts are using the track themselves.